The Myasishchev M-50 (NATO reporting name Bounder) was a Soviet prototype four-engine supersonic bomber which never attained service. Only one prototype was built, which was believed to have first flown in 1957. The M-50 was constructed by the Myasishchev design bureau. 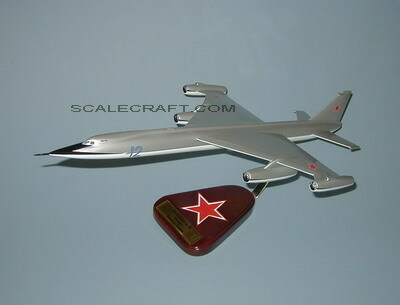 It was a fast jet bomber with four engines: two Dobrynin VD-7 and two VD-7F turbojets. Two engines were located under the wing and two on the tips of its shoulder-mounted, truncated delta wings. The second M-50 was designated M-52 and carried Zubets 16-17 turbojets, around which the aircraft had been designed. The engine installation was modified, and a second tailplane added to the top of the fin. M-50 participated in a Soviet Aviation Day flyby in 1961. M-52 was completed but was not flight tested. Mahogany wood. Scale: 1/100. Wingspan 13 1/2 inches, Length 23 1/2 inches.